If you’ve just purchased home solar panels or are looking into it then you might be wondering, “What kind of maintenance do solar panels require?” This of course is an important question as you want to care for your investment and make sure it lasts a long time. Luckily for you the maintenance that solar panels require is very minimal. With little, but consistent effort you can ensure they last decades to come. In this article we’ll discuss the best solar maintenance practices and give you tips and tricks a long the way. Solar panels are possibly one of the biggest investments you’ll ever make on your house or property. Since they do cost a lot of money you want to make sure your investment lasts as long as possible. 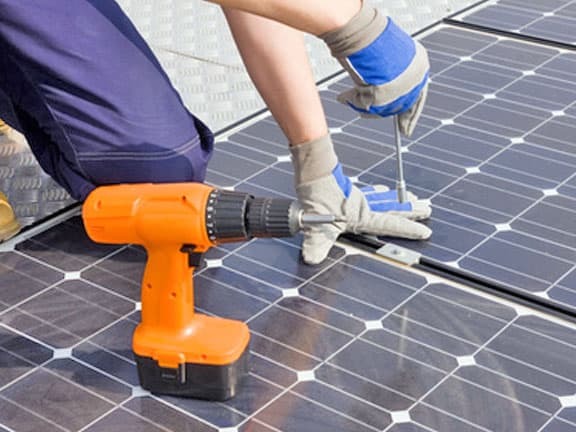 By employing the proper solar panel maintenance you allow these tools to work efficiently and even last decades or longer. One great thing about solar panels is that they typically don’t require a lot of time and money to take care of. They have no moving parts and are usually built with high quality materials. These two aspects allow them to be a stress free tool that doesn’t require much effort. With that being said there is one thing you must do prolong their life span. This one thing is to physically clean the panels. This process isn’t hard and only takes a few minutes (depending on how many panels you have). We recommend buying a solar cleaning kit to help you do this job effectively. As we just mentioned above regular solar panel cleaning is what’s going to best extend the life of your investment. On average we recommend cleaning the panels around every 6 months. This will allow the efficiency of your solar panels to be peak at all times. Cleaning them is also a short process. If your roof has little to no room to walk on then we recommend calling the pros. They are best suited for situations like that and know how to safely clean the panels. We also recommend calling the pros if your house is too high and you’re worried about hurting yourself. If that’s not the case then feel free to do it yourself. In order to clean your solar panels you need a few items. These items include water, a solar panel cleaning solution, a bucket, a soft bristle brush, a squeegee, and an extension pole. 1. First, we recommend cleaning solar panels early in the morning or later at night. Basically whenever it’s not hot. Cleaning them while its hot can possibly damage the panels and cost you a lot of money. 2. Spray the panels with clean water and get as much gunk off as possible. After mix the water with the solar cleaning solution into the bucket. 3. Connect soft brush with the extension pole then place in solution. You can then begin to start brushing, effectively getting all the dirt off. 4. Continue to scrub the solar panels until they are completely clean. 5. Once all of the panels are clean you can spray them with water. Continue to do so until all the soap and dirt is off the panels. 6. Begin to squeegee the panels with the added extension pole. 7. Continue to do so until there is no more water and panels are completely clean. The Mr. Long Arm Solar Panel Cleaning Kit is by far the best solar cleaning kit on the market. With multiple long poles that allow you to efficiently and effectively clean your solar panels. Also within this kit is a squeegee, clothes, and a cool thing called the HydraSoar. The HydraSoar is a flow-through extension pole that connects to a standard garden hose. Allowing you to expedite the cleaning process. Overall this is a great cleaning kit. Is has everything you need except for a quality solar cleaning solution. You can easily find them on amazon for relatively cheap price. In conclusion maintaining solar panels is pretty easy. They require maintenance every half a year and the effort only lasts around 15 minutes. If you do this consistently then your solar panels will always work as if they were brand new. So good luck and feel free to message us if you have any questions. We love hearing feedback and would like to speak to you. Our website isn’t the only resource on solar panels. Come check out these other resources as they can expand your mind greatly. I am glad that you pointed out that solar panels will need to be cleaned. It makes sense because if they are dirty they will not be able to absorb enough sunlight. Like you pointed out that you should do it during the early morning or at night. It seems like it would be a good idea to hire a professional to do the cleaning for you.